From my middle school years I had a pen pal in Singapore. We exchanged letters and small gifts for years. I had a mahoosive poster on my bedroom of Singapore, a land so so far away. Unfortunatley we lost contact and even with the wonders of the internet a search for my long lost pen pal failed. 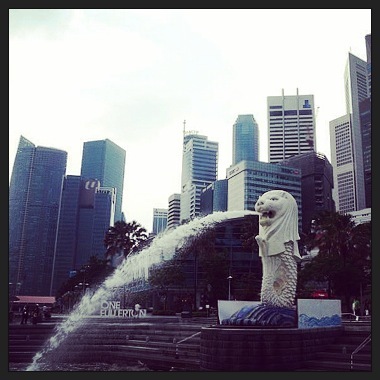 I finally made it to Singapore as part of my extended travels and spent a week exploring the city. 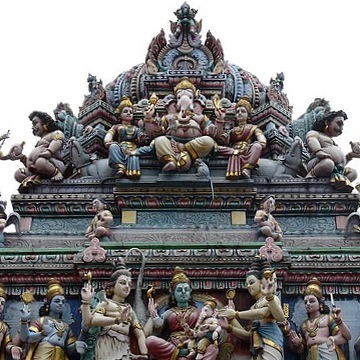 Most people visit Singapore as a stop over and the general concensus is that two days is enough, especially if you’re on a budget – it’s pretty much on par with London prices. I could easily spend another full week there! Singapore seems to be ever changing, as most big modern cities tend to but here are my top tips that I think will be around for at least our generation. Raffles Number one on the list is a trip to Raffles and have a Singapore Sling cocktail in the Long Bar. 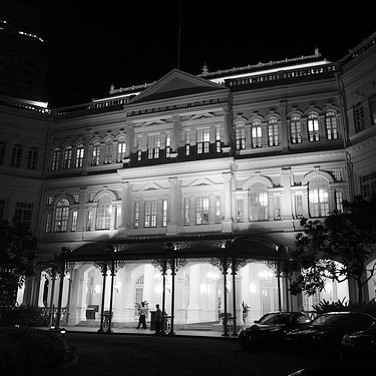 It had been a life long dream to visit Raffles after seeing a picture of my Gran and Mum outside the grandeous hotel on their way back from living in Hong Kong when Mum was little. It’s very much a novelty tourist attraction. The bar wasn’t as posh as I expected and was quite the throwback to the colonial days. A few Singapore Slings (pay a little extra to keep the glass), free monkey nuts, and a band playing was a great way to start my birthday though. Don’t forget to visit the door man at the front of Raffles on your way out who is the most photographed person in Singapore. If Singapore Sling’s in Raffles have wet your appetite, I highly recommend the ones in The Fullerton Hotel too. If you’re not on a tight budget accommpany them with a spot of afternoon tea. 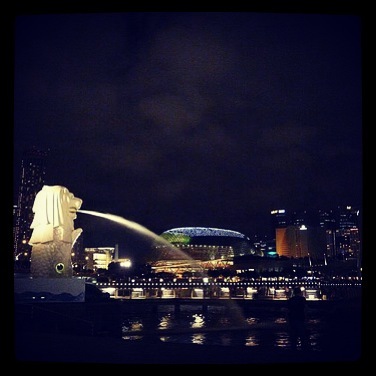 Whilst in the Fullerton area, visit Merlion Park where the 8.6 metres half lion / half fish symbol of Singapore stands and a view of the CBD area is both mesmerizing both day and night. Fat Bird – Fernando Botero A very good friend of mine introduced me to the artist Fernando Botero and the same friend came to meet me in Singapore. Botero paints and sculptures everything really fat. 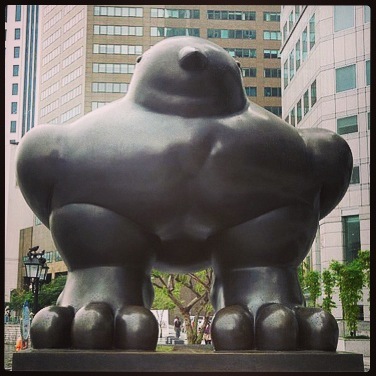 One afternoon we stumbled across Botero’s sculpture – Fat Bird. Loved it. Singapore Zoo & Night Safari Fantastic, spacious, well organised zoo taking you on a journey across the world. Open during the day and also has a Night Safari. The Night Safari starts with a 40 minute tram ride through the subcontinents, notably visiting the nocturnal animals. To be fair, I didn’t really spot too many animals but the novelty was fun. My highlight: seen wandering around – the lesser spotted Ethan Hawke. Kampong Glam The Arab quarter. 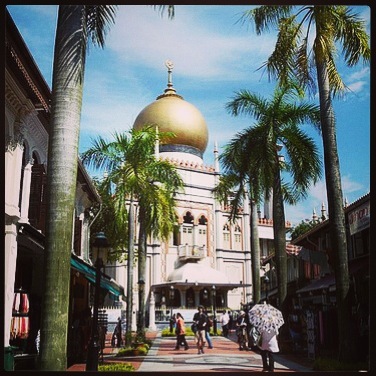 Situated at the end of Bussorah Street in the Kampong Glam area, you forget what city you’re in, let alone the country. Palm trees, colonnial houses and the beautiful Masjid Sultan Mosque. Stop off on Arab Street for some falafel bites. We stayed the week at The Sleepy Kiwi (was known as Sleepy Sam’s Hostel when we stayed) which use to be part of the Sultan’s compound. Shoes are to be left at the bottom of the stairs before climbing up to the rooms. It still amazes me that I came away without a single pair stolen. The shared bathrooms were ornate and tiled and after three months of backpacking it was nice to have a private twin room with large shutters which opened out on to Bussorah Street. Chinatown All of the quarters seem to be brightly colourful and highly representational of each cultural. Whilst Singapore is predominately Chinese, Chinatown is the traditional and hub of the population. Feast on chinese street food on Smith Street or head to the night markets on Trengganu Street. For dessert make sure you have a lotus seed bun, despite almost every major city having a Chinatown I’m still yet to find these anywhere else. You must pass through the food markets just to experience the horrid sickly smell of the fruit – durian. Carrying durian’s on public transport holds a hefty fine, oh so so bad. 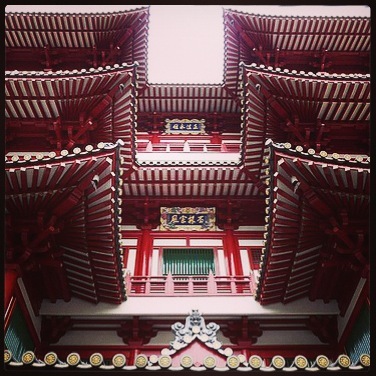 Buddha Tooth Relic Temple is one of my favourite temples. 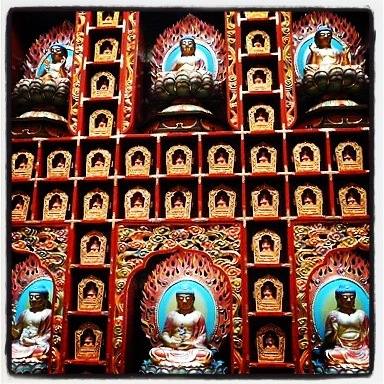 Its architectural style is based on the Tang Dynasty, painted bright red and several floors high, it was built literally to house the tooth relic of Buddha. There is something to see on every floor and you can view the tooth relic, just no photos allowed. Sentosa Island Since my visit in 2009 Sentosa has developed considerably, there’s even now a Universal Studios Theme Park on the idyllic island. There is lots to explore and beautiful beaches to visit. Take the cable car over for the day or stay a few nights at one of the five star resorts. 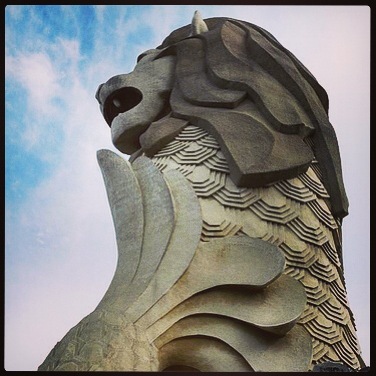 Climb to the mouth of the Merlion and take in the views of Singapore. 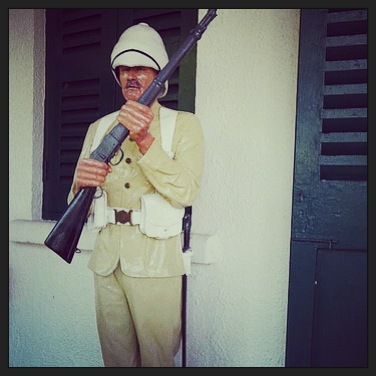 If you’re a fan of war museums then visit Fort Siloso a WWII museum depicting the British and Japanese surrender, complete with full sized 1970’s interactive figurines. Saving the best till last. 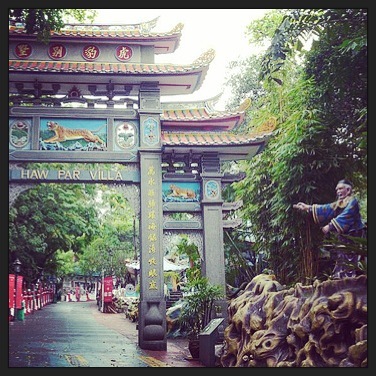 HAW PAR VILLA. This place deserves a whole blog post of it’s own but I’m not a great writer. So instead I shall leave it to the experts http://en.wikipedia.org/wiki/Haw_Par_Villa and the link to my flickr album http://www.flickr.com/photos/hwatson78/sets/72157620755676339/ Seeing is believing! Go visit The Ten Courts of Hell! And finally, walk down the Esplande, watch out for the afternoon showers due to the humidity, take a boat trip and see Singapore at night, visit a museum or shop up a storm. Singapore really does have something for everyone. ← When did Brisbane get so hipster?